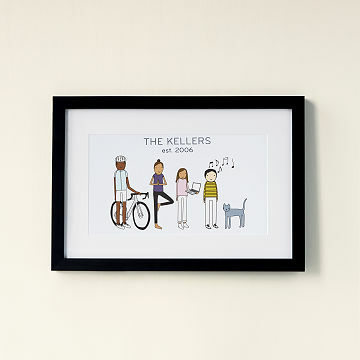 Represent your unique family with this personalized artwork by Mary and Shelly Klein. You can't choose your family but you can customize your cast of characters with Mary and Shelly Klein's personalized artwork. Choose skin tones, hair, and clothing color to create a lovely lineup, then customize with your family name and the year you were established as a quirky clan. Printed on 100% archival enhanced matte paper with framed print in black BonanzaWood. Framed print comes with hanging hardware. Made in Portland, Oregon. Check out our Personalized Couple Print for a couples only version. Check out our Personalized Family Hobby Art. 2-4 figures, framed: 13.75" H x 14.75" W; 5-7 figures, framed: 13.75" H x 19.75" W; 8-12 figures, framed: 13.75" H x 25.75" W.
Unframed prints are 8" x 9", 8" x 14" and 8" x 20". Framed prints come ready to hang in black wooden frame with Plexiglass. Copyright (c) 2013 - Personalized Family Print artwork owned by K Studio and licensed to Uncommon Goods LLC. All rights reserved. The gift came in the mail to Papa from the dogs. It was not the traditional valentine and he placed it right away up in our living room. He was very surprised as it is not the usual gift for valentine's...more personal. My wife loved the family drawing that me and my son picked out. It's a great purchase and definitely not what one would consider common. I suggest a broader choice of fonts and images. So cute and really fun to give. Loved picking out the people!! Loved this gift idea!! The product arrived quickly and as I ordered it. The only thing that might improve the product is if the buyer could have more detail options for the characters. Our daughter was looking for a fun unique gift her her mom for Christmas and this turned our to be the perfect choice. She was able to select each family member character which best represented them and also our pets, we have 2 dogs, a hamster and some fish. It was a fun process viewing the selections on the screen before placing the order and it arrived exactly as we expected. The frame is matte black and has clean modern lines. Very attractive, yet simple. My wife absolutely loved this personalized gift! I looked at this personalized art work many years. I felt as though I was giving a gift that was very special because I was able to personalize it. My family loved it! This product is hanging in my living room. We customized and ordered from a cell phone. This process took longer than expected due to screen size making customizing by scrolling hard. Wow was better than the description my wife loves it!! The only thing I would change is more color choices.